Make no mistake, folks. We did not just play the Oakland A’s. We played the Green Sox. I know I’ve said this before, but every once in a while I just wonder at how true it is. Every so often, we notice that there’s a particular team that absorbs several guys who used to play for us. There was a time in the recent past when the Dodgers could be thought of as the Blue Sox. The A’s now fit that bill. This was kind of a quiet one. No big heroics. No extra-inning comebacks. Just grinding through. We seem to be doing a lot of that lately. We scored first and put the A’s in an early two-run hole. Napoli singled and moved to second on a throwing error. Nava got hit. Salty’s flyout put both runners in scoring position. Iglesias flied out. And both runners scored on Holt’s single; the associated throwing error was a nice touch. Unfortunately, there weren’t that many scoring chances after that, and the ones we did have weren’t maximized. Which is unfortunate because Lackey, who sailed pretty smoothly through four, allowed the A’s to score in the fifth and tie it in the sixth. First he gave up a run thanks to a single-double combination. Then he gave up a leadoff solo shot to, of all people, Jed Lowrie. He left the game honored with the win. We put it away in the eighth inning. Iglesias singled, two outs later Victorino got hit, and both scored on a single by Pedroia. Bailey pitched the eighth, Uehara pitched the ninth, and the final score was 4-2. It’s bad enough to allow your opposition to score runs. It’s bad enough to allow your opposition to score a lot of runs. It’s even worse to allow your opposition to score a lot of runs while you yourself score absolutely no runs. But one of the worst scenarios is when you allow your opposition to score a lot of runs while you yourself score absolutely no runs because the opposing pitcher is someone who used to pitch for you and is somehow having a great day. There are various teams in the majors that tend to absorb our players when we allow them to walk or when we trade them away. Oakland has apparently become one of those teams. Ladies and gentlemen, I give you the Green Sox. Bartolo Colon held us to zero runs. 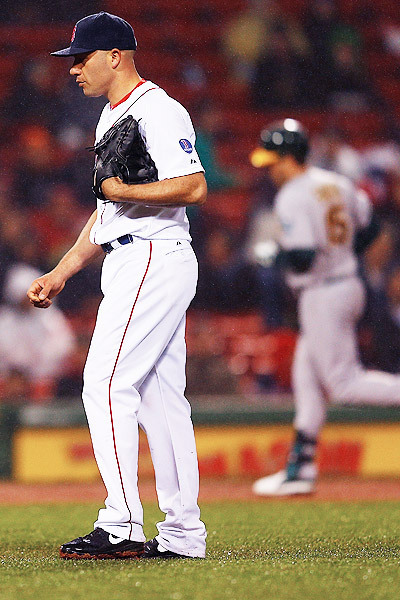 Meanwhile, Aceves lasted less than four innings; he recorded the first run in the fourth and was taken out in favor of Steven Wright, but both should share in the blame. Aceves had a one-two-three first. It was his first good inning. He gave up a single and a walk in the second but didn’t give up any runs. It was his last good inning. Then he imploded. Aceves issued a four-pitch walk to open the third. He gave up a single to Coco Crisp and another walk to load the bases. He then walked in the first run of the game; it would be the first of six that inning alone. Yes, walking in a run was embarrassing but, in the grand scheme of how the game turned out, not nearly as embarrassing as how it would end. Aceves finally recorded the inning’s first out but then gave up a single that scored two. Then he balked, which put two runners in scoring position; a sac fly scored one, and a single by Josh Reddick scored the other and put him at second thanks to a throwing error by Aceves himself. Then he balked again, which moved Reddick to third, and he scored on a throwing error. The inning finally ended with a groundout. Crisp grounded out to open the fourth, and then Aceves went right back to it. He gave up a double and then a home run. Then Jed Lowrie singled, and Wright came in, ending the inning on a double play. Wright didn’t let any of his inherited runners score. He just put his own runners on base and let them score. He gave up a single to lead off the fifth, struck out Reddick, and issued two consecutive walks. He then gave up a double to Crisp, which scored two, followed by a single, which scored two. Then there was a passed ball, a fielder’s choice, and finally a flyout. Wright issued two consecutive walks yet again to begin the sixth. He gave up a double to Reddick that scored one and then send the A’s down in order. Wright gave up two singles in the seventh but didn’t allow any runs. And that’s as far as we got. Rain prevented the playing of the game’s last two innings. I at least would have wanted to see the contest through, but perhaps we’ll be able to draw on the extra rest to win a sorely needed contest at some point. Baseball works in mysterious ways sometimes, but the outcome of this one, at least, was decisive. We lost, thirteen-zip. We had three hits and only one walk; we were 0 for 3 with runners in scoring position and left four on base. Pedroia, Salty, and Gomes were the ones who singled; nobody hit anything for extra bases. Ellsbury was the one who walked. Aceves took the loss. In other news, the Flyers beat the Bruins, 5-2. Grandiose tends to refer to something that is absurdly exaggerated. If we’re talking about goodness, then yes, I would say that there were enough aspects of yesterday’s performance that were sufficiently full of goodness so as to warrant the description of grandiose. Doubront had himself another decent start. He left two outs into the seventh after giving up three runs on three hits while walking five and striking out eight. He threw 113 pitches, sixty-seven of which were strikes. Unfortunately, he gave up some runs to some familiar faces. Jed Lowrie walked to start the second, moved to third on a double, and scored on a wild pitch. Josh Reddick was at bat at the time, and he ended up singling in another run. In the fifth, Doubront loaded the bases thanks to two walks and a single; one of those walks was issued to Coco Crisp, who thankfully didn’t end up scoring. The best part of that inning was the fact that Doubront escaped that situation after allowing only one run, which scored on a sac fly. Mortensen came in for the rest of the seventh; although he did record the first out of the eighth, he also gave up a walk, hit a batter, and then gave up two consecutive doubles, the second to Lowrie, which scored three runs all told. If Victorino hadn’t hauled in the second out out of the frame with a clutch catch, things may have ended differently. Alex Wilson relieved Mortensen, walked a batter, and was replaced by Tazawa, who finished the inning. Bailey pitched the ninth. Thankfully, and I mean really thankfully, none of the interminable mess that was the pitching staff’s performance yesterday impacted us. We scored so many runs that the six the A’s managed to eke out made absolutely no difference on the game’s outcome. We went down in order and on twelve pitches in the first, which was by no means an indication of what was to follow. Papi and Napoli hit back-to-back doubles which put us on the board, shrinking the deficit to one. Ellsbury doubled in the third, but it didn’t amount to anything, and Oakland fans were probably getting comfortable. After Papi struck out to lead off the fourth, Napoli got hit and Nava doubled. Middlebrooks took both a curveball and a fastball for balls and made the hitter’s count, count. He got a big mistake of a slider and rocketed the ball beyond the Monster on a straight shot out of the park. The ball looked like it was in a big hurry; he crushed it. And we were instantly up by two. That sac fly in the top of the inning raised the deficit to three. It would be our last stint behind. Victorino opened the fifth with a single on his third pitch. Pedroia reached on a force attempt on his fourth pitch. Papi walked on five pitches to load the bases. But Napoli needed only two pitches. He took a curveball for a strike. Then he got an eighty-nine mile-per-hour four-seam fastball that looked prime for one of his power displays. And he delivered. Over the Monster too, no less. Except that you should probably remember that the bases were loaded at the time. So, basically, Napoli hit a grand slam. Let me repeat that. 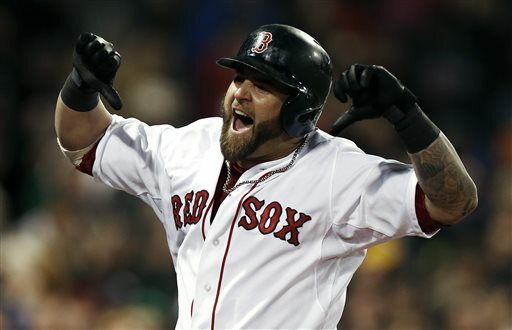 Mike Napoli, with nobody out in the fifth inning, hit a grand slam on a four-seam fastball over the Green Monster in Fenway Park. It was the fourth grand slam of his career and, as I always say with his mammoth power swings, it looked like it was a regular, run-of-the-mill swing while it was happening. It was only after the ball began its far yet fast journey out of the park did you realize what had just happened. It was awesomeness in one of its purest forms. Oh, by the way, Napoli leads the American League in RBIs. And we weren’t even done. Nava reached on a fielding error, and then Middlebrooks popped right into a force out and scored on a double by Salty. Then we were done. The final score was 9-6. It should have been nine to something much lower than six, preferably nine-zip. The pitching staff, particularly the relievers, should not have given up all those runs or all those walks to begin with. We were fortunate that we’d scored nine runs and could take it. As we’ve seen recently, that’s not always the case. But for now, at least, we can still celebrate. The small stuff first. We signed Nick Punto to a two-year deal; it’s a solid signing. He’s a scrappy player with a decent bat who’s great in the field. He also seems to have a reputation for a good clubhouse character, which may be helpful at a time like this. We signed Albers to a one-year deal, and we tendered Aceves, Bard, Morales, Aviles, Ellsbury, and Salty. Rich Hill is now a free agent. Jenks had back surgery. Incidentally, the bid for Japanese pitching phenom Yu Darvish is rumored to be even greater than Dice-K’s bid. He’s going to Texas. Some say he’s better equipped to succeed here, but Dice-K has made me skeptical and bitter. Bard is unofficially officially a starter. I know that because we just traded Lowrie and Kyle Weiland to the Astros for Mark Melancon, a reliever who played for the Yanks in 2009 and 2010 but who closed for Houston last season. Obviously, Lowrie is the one of those two with the higher profile. He had phenomenal potential that was substantially hindered by injuries; there’s no escaping that fact. The team had needs that Lowrie, as a result, was unable to fulfill; perhaps he will help the team best as trade bait. But we won’t know that until Melancon has pitched well into the season for us. Truth be told, I would argue that, although his stuff seems impressive enough, we don’t really know all that much about him in the context of the Major Leagues. Last season was his third in the big show; he pitched 74.1 innings in seventy-one games, gave up five home runs, walked twenty-six batters, posted an ERA of 2.78, and struck out sixty-six. His WHIP was 1.22. Last year was the first season in which he posted a save at all, and he posted twenty of them. And he’s twenty-six years old. From all of this, we can learn that he’s young, he’s new, and he knows absolutely nothing about what it means to close regularly for a team like the Red Sox in a city like Boston in a league like the American League in a division like the AL East. As I said, it seems like he’s got the raw goods, but at this stage, I do not feel comfortable with him being slotted as our regular closer right off the bat (pun not intended), hands-down, no questions asked. Throw in the fact that he had major surgery on his right elbow early in his career, and there are definitely some doubts. Then again, the surgery was a few years ago, and Paps at one time was also untested, and so is Bard as a closer. They have absolutely electrifying fastballs; Melancon gets up to ninety-five miles per hour. He also works with an effective cutter and curveball. Brad Mills seems to think he can do it. All I’m saying is that Melancon has some big shoes to fill in the biggest baseball town in the country. Hold onto your hats, folks. Hold onto your hats. Bill James’s predictions for the coming season are in. He has Ellsbury, Pedroia, Gonzalez, and Papi all declining in batting average; Youk’s average is slated to markedly increase since he hopefully will be starting the year more healthily than the way he finished last year. We can expect one additional home run from Papi this year; more importantly, James’s prediction shows that Papi’s power will perpetuate. Gonzalez and Ellsbury are also slated to go yard more frequently. Pedroia supposedly will be stealing about ten less bases, but the reason why he probably didn’t get a strong projection all around is because he was injured. Provided that he isn’t injured, he’s going to rock it. Look for Gonzalez to perform better than expected as well, since he’ll be entering his sophomore season with us and since he’s now sufficiently removed from his offseason shoulder surgery. And lastly, literally, it looks like last season really was Tek’s last season with us. Salty has found his footing, Ryan Lavarnway is coming up, and Kelly Shoppach is coming back. Obviously it won’t technically be official until Tek signs with another team or retires, but it looks like the year of the goodbye will continue. We acquired Tek from the Mariners in 1997 and probably didn’t even know at the time the extent of the impact he would make upon arriving. His entire Major League career was played here. His development as one of the best catchers in the game was completed here. Honestly, I always thought he would retire here, and it’s a true shame that he isn’t. True, his last several seasons saw a marked decline in both performance on the field and leadership influence off the field, but we’re looking at the whole picture here. Since he’s spent his entire professional baseball life in Boston, we can speak in terms of career numbers. He is a career .256 hitter with 193 home runs, 757 RBIs, 614 walks, and a .341 OBP. But we never expected him to be a hitting catcher. We expected him to be a catcher, period, and what a catcher he was. He has played in 1,488 games and started 1,372 of them. He has picked off 10,166 batters and caught 184 stealing. His fielding percentage is .994; last year he made only four errors, and the year before that he made none. His catcher’s ERA is 4.17. And obviously some of his greatest contributions go well beyond even those stellar fielding numbers. He was a true leader in every sense of the word both on and off the field, which is why he wore the “C” on his jersey, a rarity in baseball these days. He knew the pitchers inside and out and could adapt on the fly in any situation, which is why he caught and called four no-hitters, a Major League record. There is also something to be said for having such a veteran on the team, especially with a collaborative and positive personality like his, to ease transitions and be a moderating force in the clubhouse. And, of course, no tribute to Tek would be complete without mentioning the contribution of the forever-to-be-remembered A-Rod fight on July 24, 2004. It was a turning point in the season. It was legendary and historic. It was epic. To his credit, he has a Silver Slugger, a Gold Glove, three All-Star selections, two World Series championships, and the respect and affinity of Red Sox Nation. He was the quintessential team player, and I firmly believe that his character and quality as a player and teammate warrant consideration for employment within the Red Sox organization, hopefully as a coach. We remember what you’ve accomplished here, and we won’t forget it. You’ve seen us at our best and worst; it’s been a phenomenal ride. 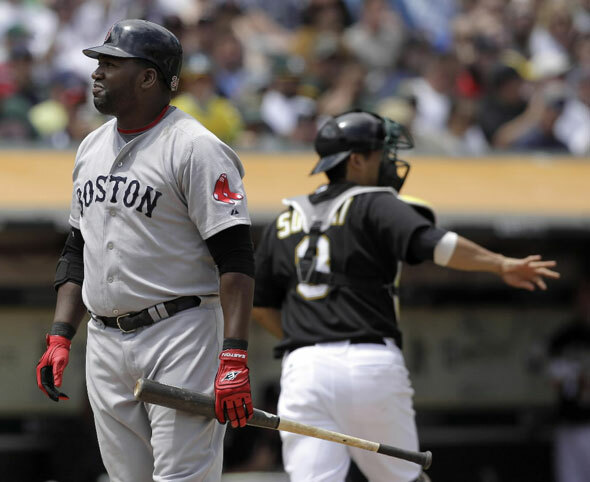 We as Red Sox Nation salute you, Tek. And you will most definitely be missed. In other news, the B’s shut out the Kings, womped the Sens, and crushed the Flyers in a particularly impressive six-zip shutout. We scored our first goal in the first minute of the game and four goals in the first period alone. We’re nursing a four-game winning streak and are tied with the Flyers at the top of the conference. I’ll be taking a break for the next two weeks. I expect winning signings when I get back. Good, solid deals that will address the team’s needs. It doesn’t have to be flashy; we’ve seen the detrimental effects of fixing what isn’t broken and being flashy for flashy’s sake around the league, and we’re not going to do that. Just some good, solid deals and we’ll be fine. I had high hopes for this game. Very high hopes. After all, it is the Orioles, and we are throwing Beckett. Oh, wait. Beckett lasted six innings. He gave up six runs on seven hits, two of which were home runs, the first a solo shot with one out in the second and the second a three-runner with two out in the sixth. That three-run home run was an inside-the-park home run. Ellsbury looked like he was about to make a particularly Ellsbury-esque catch, the kind of catch that only Ellsbury could make. Instead, he collided with the wall and lost the ball. It was the first inside-the-park homer the Orioles have hit at home and the first we’ve allowed since 2006. Thankfully, Ellsbury is okay. The game’s result, not so much. Beckett walked four and struck out five. He threw 108 pitches, seventy-one of which were strikes. What can I say? He didn’t have it. We’d just played fourteen innings against New York and some terrible games overall this month. We needed a big night. He didn’t deliver. We actually struck first. The bases were loaded with two out in the first, but Lowrie flied out. What a waste of an opportunity. We plated one in the second; Drew led off the inning in the first and was out on a force by Scutaro, who scored on a double by Ellsbury with a little help from some bad fielding. Lowrie must have felt really bad about that because he homered to lead off the fourth on the second pitch of the at-bat, a changeup he walloped to right field. We didn’t have many opportunities after that until the eighth, when the bases were loaded with one out and Salty and Scutaro both blew it. Then Ellsbury was hit in the ninth and scored on a single by Pedroia. And that was it. Aceves and Weiland pitched the last two innings. And they were scoreless. Not that that counts for anything at all whatsoever, since we lost, 6-3. To recap our predicament, we are now officially tied for the Wild Card with the Rays with two games left to play in the regular season. In the month of September, our record is six and nineteen with a nine-game drop in the standings, and exactly one month ago today was the last time we had even a two-game winning streak. On August 17, our Wild Card lead was ten games. If we don’t right this ship, like, immediately, we will be the first team in the history of the existence of the Wild Card to blow a double-digit lead. We’re Boston fans. We believe. We’ll always believe. But words can not describe the anger, frustration, denial, and fear that Red Sox Nation is currently experiencing. We have to win today. At the very least, Johnny Pesky deserves a happy ninety-second birthday. In other news, the Pats lost a close one to the Bills, 34-31. It should never have come to that. And sweep we clearly did not. Although we obviously should have, being that it’s Baltimore and all, which makes it so much worse. At least we split. It was a day of opposites. Kyle Weiland started and did not have anything close to resembling a good day. He cruised through the first two innings with one of the better cutters I’ve seen from him and then all of a sudden everything went wrong both in the field and on the mound. He threw eighty-five pitches through four and two-thirds innings. Fifty-two of those were strikes; he walked two and struck out five. He gave up six runs, five earned, on five hits. Only two of the runs he gave up did not score via the home run. Yup. You read right. He gave up three: a two-runner and two solo shots. And you can thank McDonald’s sun-induced fielding error in the third for that unearned run. 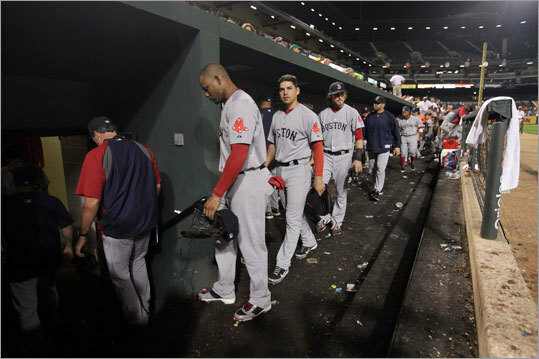 Doubront and Aceves combined for a scoreless rest of the game after that. We did our best to battle back. I guess McDonald really felt bad about that error because he led off the bottom of the frame with a solo shot on the second pitch of the at-bat, a fastball that he promptly sent into the Monster seats. We got another run back in the fourth on Salty’s RBI triple. And we got two back in the fifth with the progression of Scutaro’s walk, Gonzalez’s RBI double, and Pedroia’s RBI triple. Scutaro’s double and Gonzalez’s single combined to bring in another in the seventh for what would be our last run in a 6-5 loss. Oh, and by the way, that foul ball that Papi hit in the fifth wasn’t foul at all. It was fair. It was fair by a mile. The worst part is that it wasn’t a potential home run, so it couldn’t be reviewed. But it was fair, and it made the difference. He went on to fly out, although that ball was almost out too. Did I mention that Jeremy Guthrie leads the American League in losses? There’s no way it should even have come to that. Lackey started and did not have anything close to resembling a good day, either. The difference was that the offense turned itself on in a big way. Without that, the O’s would have embarrassed us completely. Lackey lasted four and a third innings and gave up eight runs on eleven hits. He walked two and struck out three. He threw 105 pitches, seventy-five of which were strikes. It was Atchison who relieved him and picked up the win. Morales allowed another run, and then Albers and Bowden finished the game scoreless. Let’s get to the good stuff. The O’s may have put up a three-spot in the top of the first, but we answered with a four-spot in the bottom of the inning. 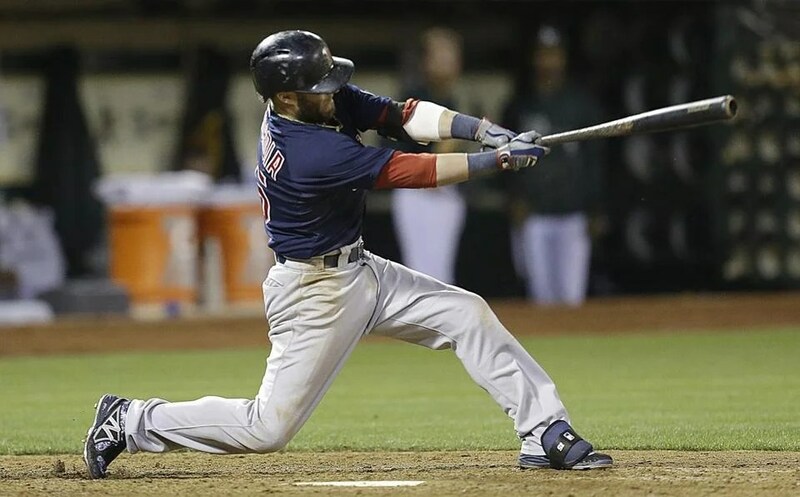 Pedroia brought in one on a groundout, and then Lowrie unleashed on the eighth straight four-seam he saw in his first at-bat for a three-run shot. He also put it in the Monster seats. It stayed just fair and got out of the park in a hurry. We added two more in the second; Scutaro doubled in one (had McDonald not been out at home, it would have been two), and Pedroia stroked an RBI single. We busted it open in the third with a five-spot. McDonald started the scoring plays with an RBI single and a little help from a bad throw. Ellsbury doubled him, and he scored on a single by Scutaro. Pedroia and Papi brought in two more with back-to-back RBI singles. But if you thought that that inning was big, it was nothing compared to the seventh, when we put up a seven-spot. Seven runs in seven innings. We scored more runs in that one inning alone than we have in some of our games recently. The highlight was the first to occur. Ellsbury led it off. He took a fastball for a ball, fouled off another, and took a changeup for a ball. Another changeup made the count 2-2. And then it happened: a rare result of the perfect combination of hitting and speed, a manifestation of skill and luck. Jacoby Ellsbury hit an inside-the-park home run. 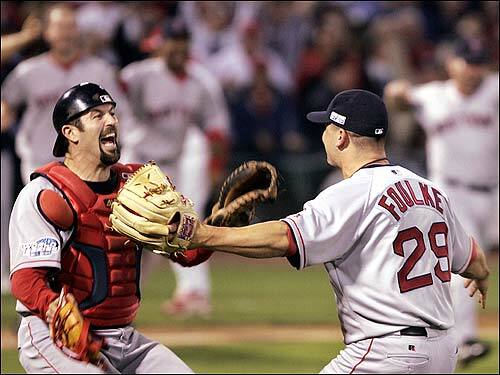 It was the first on the team since Youk did it on May 28, 2007. I saw it and I couldn’t believe it. It was perfect. It’s one of those things that you always imagine in your head, trying to draft the perfect conditions under which something like this would result and then hoping you’ll see it but assuming you won’t. It’s the triple play of offense. And he executed it without a flaw. The ball sailed out to center field. It bounced off of the top of the bullpen wall sharply at some sort of strange angle and ricocheted out to center field. The outfielders couldn’t get to it in time; meanwhile, Ellsbury had his head down and put the pedal to the metal. He was safe with some time to spare. And then Lowrie hit an RBI single. And then Conor Jackson hit a grand slam on a fastball, which he also put into the Monster seats. It was the first time we’ve ever had an inside-the-park home run and a grand slam in the same game. And then we were done. No big deal. The final score was 18-9. As a result, the whole doubleheader was a surreal experience. I felt like I was watching two different teams in the two different games. In other news, the Pats made the Chargers look like amateurs. The final score was 35-21. This is going to be a truly fantastic season. We lost. Again. I can’t believe this. It was devastating. Weiland gave up three runs on six hits. He walked three and struck out only one. He lasted only four innings. He threw eighty-two pitches, forty-six of which were strikes. Clearly he was inefficient and generally sub-par. Aceves came in and delivered four absolutely crucial innings. Then Paps pitched two full scoreless innings. He retired all six of his batters. It was beautiful. And then Bard gave up a run in extras and took the loss. And that was pretty much the story of the latest collective pitching fail. Lowrie plated our first run in the second with a groundout. Then Gonzalez smacked a two-run shot in the fifth on a changeup to right. I still can’t get over the fact that every single one of his swings is quintessential. It’s textbook. All of them. He just goes up there and makes it look nice and easy. Salty and Ellsbury smacked back-to-back jacks in the ninth, both to right field. Salty got a sinker, and Ellsbury got a slider. Salty’s was a hard-hit straight line drive back. Ellsbury’s was an enormous blast to tie it up. He had that pitch’s number all the way through. Basically, this is what you need to know. Heading into the bottom of the fifth, we were tied at three. Heading into the bottom of the ninth, we were tied at five. Heading into the bottom of the tenth, we were tied at five. Heading into the bottom of the eleventh, we were tied at five. And then Bard came on. And he allowed a triple on his second pitch. It landed in the gap between Ellsbury and McDonald. Ellsbury called off McDonald and dove for it, but it bounced off his glove. And then there was a groundout, and then a single that won it. Evan Longoria hit that single in an 0-2 count on a ninety-eight-mile-per-hour fastball. How does he even see that? If I sound terse and exasperated, it’s obviously because I am. Who wouldn’t be? Last night was crushing. Every time the offense battled back, the bullpen gave the lead away again. We put up nine hits, left eight on base, and went 0 for 10 with runners in scoring position. And we have a 6-5 loss in extras to show for it. We’re lucky it wasn’t more lopsided; the Rays had too many opportunities for comfort that they didn’t take advantage of. And we were actually poised to win; we had some good rallies going. And now Paps will be unavailable because he pitched two innings, and Aceves had to work overtime. But it’s more than that. Lately, we’re playing just like we were in the beginning of the season, and all of the injuries we’re currently dealing with doesn’t help. We’re on a four-game losing streak. Add to that the fact that now the Rays are only four and a half games behind us in the Wild Card standings, and you’d be hard pressed to find a reason why all of Red Sox Nation should not be terse and exasperated. In other news, we extend our condolences to those who perished ten years ago today. We honor, we remember, and we reunite. When we take the field today, we take it in memory of lives lost and in celebration of the country’s patriotic spirit.